The 5G-Infrastructure-PPP is a 1.4 Billion Euro joint initiative between the European ICT industry and the European Commission to rethink the infrastructure and to create the Next generation of communication networks and services that will provide ubiquitous super-fast connectivity and seamless service delivery in all circumstances. 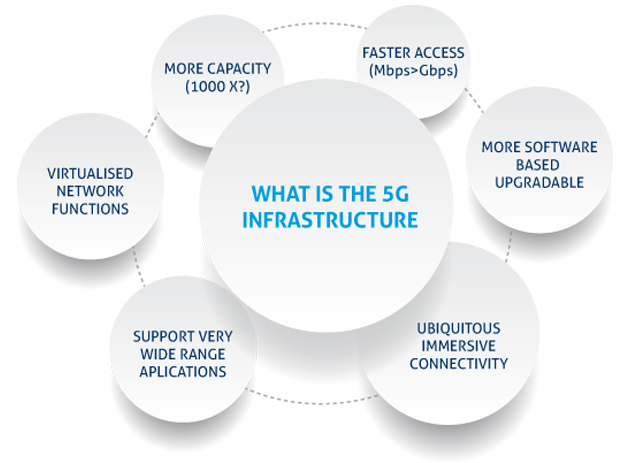 WHAT WILL THE 5G-INFRASTRUCTURE BE? Our vision is that in ten years from now, telecom and IT will be integrated towards a common very high capacity ubiquitous infrastructure, with converging capabilities for both fixed and mobile accesses. Network elements will become “computing equivalent” equipment that gathers programmable resources, interfaces and functions based on virtualisation technologies. The development of new communication networks is dependent on the emergence of globally accepted standards in order to ensure interoperability, economies of scale with affordable cost for system deployment and end users. This partnership aims to have European industry driving the development of 5G standards and to develop and exploit at least 20% of the 5G SEP (standards essential patents). Providing 1000 times higher wireless area capacity and more varied service capabilities compared to 2010. Communication networks where the dominating energy consumption comes from the radio access network. Reducing the average service creation time cycle from 90 hours to 90 minutes. Creating a secure, reliable and dependable Internet with a “zero perceived” downtime for services provision. Facilitating very dense deployments of wireless communication links to connect over 7 trillion wireless devices serving over 7 billion people. Enabling advanced user controlled privacy. This new high-performance network will be operated via a scalable management framework enabling fast deployment of novel applications, including sensor based applications, with reduction of the network management opex by at least 20% compared to today. In addition, new lightweight but robust security and authentication metrics suitable for a new era of pervasive multi domain virtualised networks and services will have to be provided.